When you're making meatballs, don't be one yourself -- be smart, and throw some chipotle spice in there, for zesty regional flare. Preheat oven to 325°F. Gently combine meat, eggs, cheese, bread crumbs, salt and garlic. Shape mixture into 20 meatballs and place on a baking sheet. Bake until lightly brown, about 6 minutes. Heat oil in a saucepan placed over medium heat. Add onion, garlic, cumin and paprika and sweat until soft, about 1-2 minutes. Add vinegar and TABASCO® Chipotle Sauce. Bring to a simmer. Add crushed tomatoes, salt and sugar to the pot and simmer for 10 minutes. Gently add in meatballs and simmer until they are fully cooked through, about 12-14 minutes. 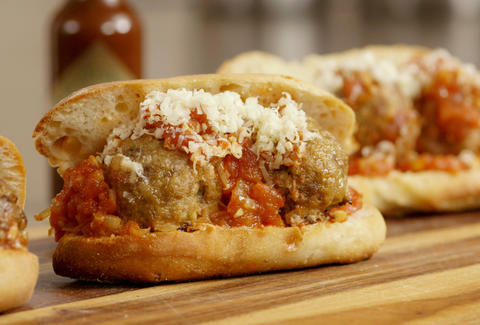 To serve, place 5 meatballs in roll, top with sauce and cheese.